Power 100 W RMS / 4 ohm. Speaker: 1 x 15 Celestion (150W, 4 ohm, 2.5" VC) + HF piezo horn . Gain, Bass, Mid, Treble, Master controls. 5 way "Style" switch for midrange control. RCA cinch CD-In inputs for mp3/drummachine. Dimensions: 53.5 x 53.5 x 39 [cm]. Chorus, Flanger, Phase Shifter, Reverb, Octaver, Echo,Slapback, Funk Wah, reverse Wah, Chorus/Echo/Wah, Octawah, SVT, Synth Bass 1, Synth Bass 2, Square Wave. For each channel you can adjust amount of effect applied and 1 parameter, ie time for delay. 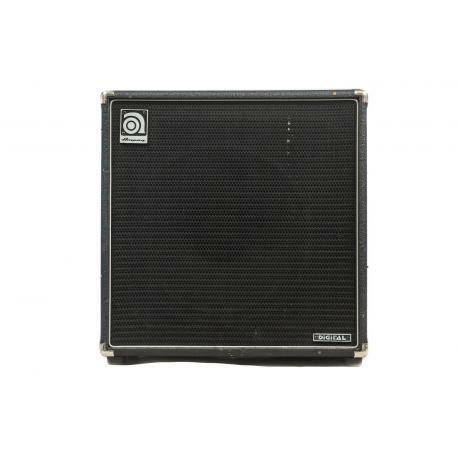 Classic, warm ampeg tone out of small cube box. Has been serviced prior to sale. Good visual condition. Some wear and tear as shown in the photos. Manufactured in 2001 in USA for 230V European market.